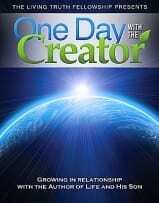 ONE DAY WITH THE CREATOR: THE TOOL YOU’VE BEEN WAITING FOR! Yes, I am aware of those things, but how wonderful to know that we have chosen the winning side in the spiritual battle raging all over the earth. Think about it: you and I have aligned ourselves with the One True God and His Son, and we are fellow laborers with them in accomplishing their wonderful purposes for every human being who will simply trust them. Just imagine what they are doing behind the scenes in conjunction with our efforts. How awesome it is have both hope for a bright future and purpose for life today. How much do you think our God of Love longs for people to know Him via knowing His Word and His Son? We have no vocabulary to describe the depth of His desire for sweet fellowship with every human being. And how heartbroken do you think God is about the condition of humanity—and about the state of the Christian Church? Hey, we are human knuckleheads like you, but we are doing our best to be honest before God and the Lord. We are endeavoring to teach the Word “rightly divided,” and it sure looks to us as though God is in our midst helping us do just that, but He cannot do what He wants to do without sufficient human cooperation. Hey, there’s a T-shirt: COOPERATING WITH THE CREATOR. That is why 25 of us got together in Orlando, Florida in July, 2011, to film a 24-hour class titled One Day With The Creator. We have invested thousands of hours and tens of thousands of dollars to produce what we firmly believe systematically sets forth the Word of God as it has not been known since the Apostle Paul penned his last epistle to Timothy from a jail cell in Rome and John wrote Revelation on the Isle of Patmos. How can that be? Because (perhaps like you) a bunch of us were once in the right place at the right time, and because we have diligently held on to, and significantly refined, what we heard. Check out the Table of Contents after this letter. My dear dad taught me not to use “four-letter’ words. Much to his dismay, I included “w-o-r-k” and “t-o-o-l” in the list of prohibited verbiage. As you know, doing a job right requires the proper tools. As Christians, our job is the ministry of reconciling people to God. As fellow laborers with God, we need tools with which to work, like books, tapes, videos, the Internet, etc. In that same sense, One Day With The Creator is a one-of-a-kind tool that God and we can use together to build what He would like to build. With the imminent release of our class, you and I have a “platinum” opportunity to present God’s Truth to the world in an unparalleled way. 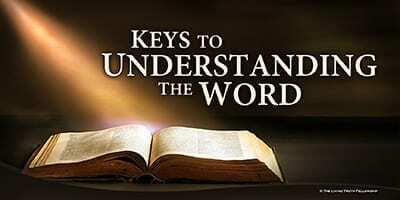 He needs you and me to “show and tell” people about this “tool” because it will equip them with the biblical keys they need to understand and apply the Author’s originally intended meaning of the Word He gave mankind. For someone who wants to build the knowledge of God’s Word into his life, there is simply no substitute for a systematic curriculum that lays such a foundation. “Piecemeal” discussions of Scripture simply do not accomplish that. If you too once heard the Truth that was in the “PFAL” class, you have some idea what I’m talking about. If you didn’t have that golden opportunity, now you do, in a significantly more accurate, concise, and entertaining presentation. And you can own it and do whatever you like with it. What happened with that previous class? Once it was put on film in 1968, it went from a farm in Ohio to 60 countries! How so? Because people young and old incessantly opened their hearts and their mouths about it to other people, and the Word of God did its job of enlightening and delivering them. Besides having the potential to radically change the life of any human being who watches it, we also believe that One Day With The Creator can be a catalyst to build local fellowships. All that takes anywhere is for even one person to decide that he or she will learn, and enthusiastically share, the Word in this class with everyone who will listen. Is that one person you? Because of the gracious donations we received, the bulk of the approximately $150,000 we have spent in pre and post-production has been covered. We plan to add subtitles and translate it into Spanish and Chinese ASAP, with more languages later, but those projects will be donation dependent. We will make the selling price very affordable while still covering our costs and having funds available to market and promote the class so that as many people as possible can enjoy it. If you want it and cannot afford what we ask, please contact us and we will do our best to help you get a copy. We think most people will want to get the class in traditional DVD format but we will also make it available to download from our website, which requires us to pay a considerable monthly fee for that capability. The downloadable version allows you to purchase the class segment-by-segment or all at once. Many people no longer use traditional DVDs and download their movies instead, and we want to be sensitive to this newer trend. We may also have the class available for rent on Amazon. WATCH FOR AN EMAIL BLAST WITH DETAILS ABOUT HOW TO ORDER THE CLASS—COMING SOON. There’s no question that human “feet on the ground” is the best advertising possible. Each one reach one is how the early Church turned the world upside down in the book of Acts. Even if we had a huge network of affiliated fellowships whereby local brethren gathered groups of people to do the class on a pre-planned schedule in a structured learning process, we would still sell the class as inexpensively as we can so anyone can own it and use it as he sees fit with his family and friends. In regard to marketing ODWTC, all your ideas are welcome. Here’s a phrase we thought of: “The Thinking Man’s Bible Class.” Once you have seen the class, we hope you will go wild promoting it however you want to. Speaking of going wild, I know thousands of people who once did exactly that about the PFAL class, which changed lives all over the world. If you were among them, do you remember the zeal you had to open your mouth and tell people what was available to them? Perhaps you still have such zeal—or more! Perhaps you recall what it was like to be a vital part of something bigger than yourself, something that provided a platform of truth upon which people from all walks of life could stand in unity. Who says it can’t happen again on an even larger scale? Who do you know that needs a systematic, precise, electrifying, hilarious, and heartfelt presentation that will absolutely build a solid biblical foundation for them? Please present this opportunity to everyone you know who is in their teens and twenties. How can you assemble a group of people with a commitment to whatever structured schedule works best for them in the least amount of time? You may have already experienced how effective such a concentrated format can be. And as you continue to present the class, people can bring their friends, sit through it again, and see great growth in their lives. No doubt you have heard the agricultural admonition, “Make hay while the sun shines.” Given that the spiritual “fields are ripe for harvest,” I’d like to suggest an edited version: Make “Hey!” while The Son shines. That is, get people’s attention with the love of Christ shining forth from your heart and then boldly speak the truth in love to them. If you and I don’t, who will?